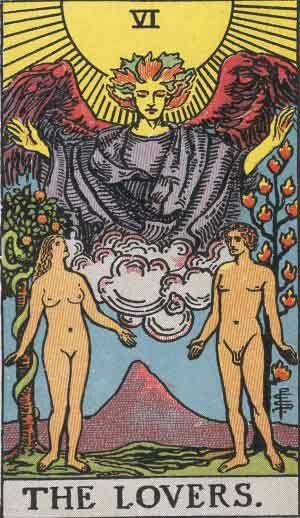 Q: What does the combination of the Lovers Card and the Ace of Cups card mean in a tarot reading? This where Tarot reading gets a little complicated…this is exactly why professionals charge for their services. You question is a perfect example of why there is more to reading Tarot cards than just knowing a meaning for a particular card. Even if you are only dealing with ONE card, you have to consider the context. What layout are you using? What position was the card in within that layout? What “meaning” did you assign to that position? What type of message was being given for the particular card? Advice? Caution? Validation? Acknowledgement? Something else? Now multiply all that by a power of 2. The more cards, the more exponentially complicated the reading becomes. I absolutely believe anyone can read Tarot…BUT it really does take time, effort and practice. Especially with larger spreads and multiple cards. That’s why #PeaceTarot starts off by teaching single card daily meditation readings. That’s the place to start when you are learning to read. Now take all of that and multiply it again by a magnitudes of ethical considerations. Romance readings are a special kind of difficult because of the other person involved. Unless you have their direct permission to read cards about them, then the reading has to focus only on you…what YOU need to do to help the relationship work or what-have-you. Putting the special relationship ethics aside, you still need context to understand the cards. 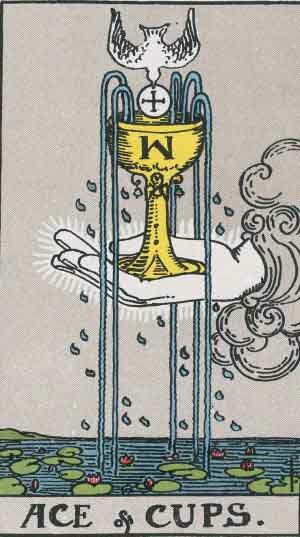 For example if the Ace of Cups represents the lessons from the past, you might get a different overall message than if the Lovers was in that position. For example, if we interpret the Ace as “inner light” (as Diane Morgan does) and that is a lesson from the past, then the overall meaning might be using your inner light & spirituality to help achieve your dreams and desires. Now switch things around. Lovers symbolizes your deepest desires. If the lessons from the past is to look at desires and what you’ve learned from them…the message may be more like what are your desires are doing to your spiritual development? Are your desires feeding your inner light or hampering it? The difference between the two messages is a bit subtle, but it could mean the difference between giving a good reading, and giving a really masterful one. So the real answer to your question is that I can’t tell the meaning without knowing the context in which the two cards appeared. That’s also why I used to charge more than a per-card rate for the bigger readings…they are more complex and take more time and effort to interpret than a 1 card reading. The more cards, the more inter-relationships like this…the more skill it takes to read. Goes to show what a bargain the per-card thing really is. That’s also why #PeaceTarot teaches one card daily meditations. That kind of reading is the most accessible to beginners. If you were reading for yourself, jot down the questions, what cards you got and their position meanings, then I can help you understand the cards and the reading as a private lesson / DIY consult if you like. Have you ever done a reading for yourself, but wound up with questions like this one? Send me the details and we can do a DIY Consult type of private Tarot reading lesson to figure it out together.